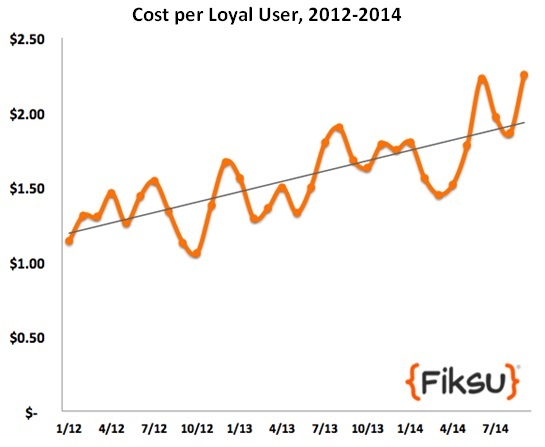 Cost per loyal user index shows the trend of rising costs for marketers to acquire loyal app users, over a 2 year period. BOSTON, MA--(Marketwired - Oct 27, 2014) - Fiksu, Inc. (www.fiksu.com), developer of award-winning app marketing technologies, today published its latest Fiksu Indexes which reflect the impact of iOS 8 and new iPhone 6/6 Plus launches on app marketing. The September Indexes show ongoing increases in app marketing costs and app downloads, with the benchmark Cost Per Loyal User Index reaching an all time high. These increases were largely spurred by the unprecedented adoption of new Apple devices along with growing demand for mobile media across the board, causing the rising tide in mobile marketing competition, app downloads, and media costs. Fiksu's Cost per Loyal User Index increased by 21 percent in September to $2.25 from August's $1.86. Rising 34 percent year-over-year, this new high-water mark reflects the enduring trend of increasing activity and competition to capture loyal app users. While we have reported the increase month-over-month and year-over-year, it is important to note that there is more enthusiasm for devices and apps than ever before. As evidenced in Fiksu's usage tracker, adoption of the new iPhone 6 was a whopping 116 percent higher than that of the iPhone 5 in the first 30 days post launch. App marketers realize these new users are extremely valuable and, as a result, they're eager to compete for their attention. New device owners are active and enthusiastic about apps, and are prime audiences for adding multiple new apps to build out their devices. Fiksu's Competitive Index also increased in September with 5.5 million daily downloads from August's 5.3 million, representing a 4 percent increase month-over-month. The Competitive Index measures the average aggregate daily download volume of the top 200 ranked iOS apps. While this metric had a 4 percent decrease year-over-year, a contributing factor is likely the space limitations of iOS 8 that required users to free up storage, and therefore limited the number of apps downloaded in September compared to last year. Another possible factor could be the reduction of the Top Charts in the App Store from 300 to 150 apps, as some of the apps tracked in the Index are no longer scrollable in the top apps listings. The Cost per Launch (CPL) Index, which tracks the costs of driving engagement from mobile users, showed an increase on iOS to $0.29 representing a 36 percent rise month-over-month and 48 percent year-over-year. Cost Per Install (CPI) increased 6 percent from August to $1.23, for a 41 percent rise year-over-year. Contributing factors include the combination of competition, rising user activity and media costs, along with users deleting apps to free up storage space for iOS 8. All of these actions led to increased costs across all iOS 8 metrics. "The escalating year-over-year growth of mobile devices, apps and media costs highlights the immense opportunities and challenges facing marketers today," said Micah Adler, CEO of Fiksu. "The launch of a new iPhone and iOS in September only sets the stage for app marketers as they head into the busy holiday season. We expect to see even more activity as a result of the new iPads and Android devices from Samsung and Google's Nexus family in the coming months." CPL on Android dropped to $0.08, down 10 percent month-over-month and 9 percent year-over-year. Android CPI, however, increased to $1.00, up 14 percent month-over-month and 33 percent year-over-year. On both iOS and Android, it is clearly a very competitive time for app marketers to reach users with an ongoing flurry of activity expected throughout the holiday season. For Fiksu's full September analysis, visit http://www.fiksu.com/resources/fiksu-indexes#analysis. Fiksu is the leading provider of mobile marketing products. A data-driven mobile ad tech company, the power of Fiksu is fueled by information assets from over 3.3 billion app installs and 4.7 trillion marketing events tracked across 1.7 billion devices. The company's patent-pending Programmatic Mobile Demand Platform applies intelligent technology to proprietary big data to master ALL the challenges of mobile advertising -- including tracking, optimization, media buying and integration. This cohesive approach spans the entire mobile ecosystem and ultimately delivers the best marketing performance. Additionally, Fiksu offers FreeMyApps®, the world's largest app discovery platform where users are rewarded. Based in Boston, Mass., Fiksu is venture-backed by Qualcomm Ventures and Charles River Ventures. More at www.fiksu.com, @Fiksu, and on the Fiksu blog.